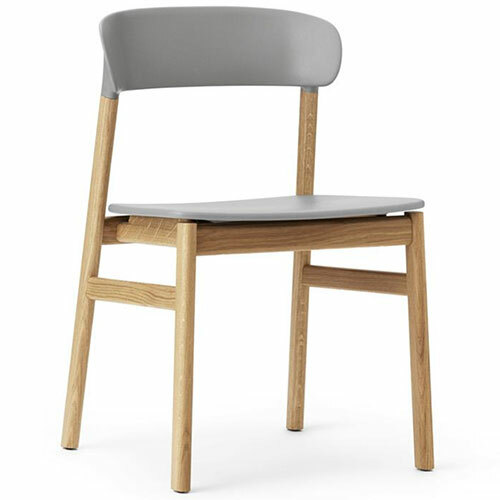 Danish design traditions have left a clear mark on Simon Legald’s chair series, Herit, which is short for heritage. The simple and honest style that characterizes Danish furniture history stands as a clear frame of reference for a collection draped in nostalgia. But Herit is just as much a design that looks forward. Innovative production methods, new material compositions, and timeless silhouettes give life to a chair that stands tall on its own. Herit reflects Simon Legald’s love of classic Danish furniture craftsmanship, but rose from a desire to design a versatile and strong chair that unites the different eras of Danish design. A chair in which oak and plastic merge in tactful synergy, to create a hard-wearing, maintenance-friendly and accessible design, made for modern life. The balanced materials complete a design expression that is contemporary and everlasting. With tradition and renewal combined in equal measure, Whether it moves into a classic apartment, a modernist building or post-modern architecture, it inhabits the space with natural ease and subtle grace. Suitable for contract/high traffic and hotel environments. The collection includes: chair with or without arms, polypropylene or upholstered seat. Designed in 2018. Handmade in Denmark. Solid Wood Frame: Natural Oak or Smoked Oak. Polypropylene Seat & Back: Sand, Black, Grey, White or Dusty Green.